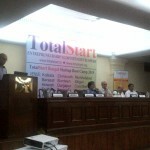 TotalStart Bengal Innovation & Incubation Center, the local operation of TotalStart Entrepreneurship Ecosystem Developers, a section 25 not for profit company focused on developing entrepreneurship ecosystems in entrepreneurially less developed regions in the country is launching at Bengal Chamber of Commerce & Industry premises (BCC&I) at 6 Netaji Subhas Road, Kolkata on 13th of May 2015 the ” TotalStart Bengal Start-Up BootCamp 2015 for Scalable Small Enterprises” where “TotalStart Bengal District Innovation & Incubation Unit” is to be inaugurated. 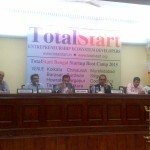 The StartUp BootCamp seminar/workshop is expected to be well represented by all the major stakeholders in small scale entrepreneurship development efforts in Bengal. 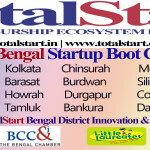 TotalStart Bengal‘s annual hunt for the 20 groomable small scalable district level entrepreneurs or prospective district level startupreneurs to be mentored and hand-held to be successful in their 2 year TotalMentor Business Mentoring Program is on for the following 6 months with 12 more StartUp BootCamp workshops to be conducted at District MSME Facilitation Centers across 12 Districts in Bengal. 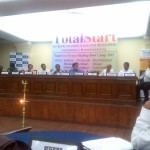 To apply one should reach out to TotalStart Bengal at secretariat@totalstart.org or call +91 33 2573 5562. 10:35-10:45 Welcome Address Sri S. Radhakrishnan, President TiE Kolkata, Past President, Bengal Chamber, Director (past MD) DESCON Ltd, DPSC Ltd. Entrepreneur: Sri Manish Kumar Saraf, Founder & Director – Ujjeewan Healthcare Pvt. 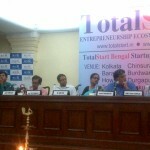 Ltd.
Sri S Radhakrishnan President of TiE Kolkata, Past President of Bengal Chamber. Presently Director (Past MD) at Descon Limited. Past MD of DPSC Ltd. Director at West Bengal Power Development of Corporation, JSW Bengal Steel Ltd and Advisory Board member Army Institute of Management. 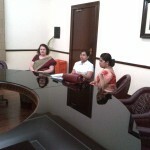 A company secretary by education has elevated to lead some of the best companies and organizations in Bengal. As astute administrator and an organizational leader. Sri Radhakrishnan is an institution unto himself supporting building fledgling organizations and building new ones. Dr. Suryanil Ghosh Dr. Suryanil Ghosh a Dreamer-Implementer is a Serial Entrepreneur, an Angel Investor, an Entrepreneurship Ecosystem Developer, an Intrapreneur, a Technocrat and an Educator with about 25+ years of global experience. His passion since last few years as the Chairman of TOTALSTART ENTREPRENEURSHIP ECOSYSTEM DEVELOPERS (A SECTION 25 COMPANY) is: To build entrepreneurial ecosystems to “sustainably” nurture and develop “home grown” entrepreneurs and enterprises in entrepreneurially “less developed” regions in the world, networked with resources from entrepreneurially developed regions in the world, in domain specific business areas “relevant” for the region. He is also the Chairperson of Bengal Chamber Entrepreneurship Development Cell and a Charter Member & Executive Committee Member of TiE Kolkata. He holds a PhD in Artificial Intelligence from the University of Alberta, Edmonton, Canada.Founder & Chief Mentor of TotalinX Group, founded in Germany in 2002. Through 2008 and 2009 he was also engaged with a globally leading Lab Automation Software company’s Global Leadership team. Prior to that he was the Chief Operating Officer managing a globally leading software services and solutions provider in the Financial Services specific to the Payments Industry. He started his professional career at one of the Big Five Consulting company and moved on from there to head the Global SBU of one of the then top 5 Indian IT organizations. Sri Dipankar Chakrabarti Mr Dipankar Chakrabarti is a Director at PricewaterhouseCoopers for Risk & Quality. He has a very wide experience in Systems & Management Consultancy and technical projects, with a specific focus on e-Commerce enablement. His domain knowledge spans from metals and mineral industry, nuclear power plant, retail chain, public sector to manufacturing industry. He has managed and executed projects in the US, Japan, Germany, Singapore, South Africa and in India. He has had done projects on Human Resource management, financial management, material management, Distributed Inventory Management, Sales and Dispatch, Production Planning, e-Auction Management, e-Payment and e-Procurement Management. He was the head of Knowledge Process Outsourcing for one of the steel production giants of India. He was involved in all the phases of the software development life cycle and well versed with SSAD, OOAD and Agile Programming techniques. He has implemented quality processes like ISO 9001:2001, ISO 27001, SEI-CMM Level 3 and Business Excellence model based on Malcolm and Balridge. He has experience in managing large project teams across multiple countries. He is a Life Member of Indian Institute of Chemical Engineers, Affiliate Member of Computer Society, IEEE and Technology Committee of Confederation of Indian Industry. Member of Standards Committee 23026 of IEEE. 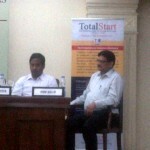 And most importantly this man of immense experience and knowledge is a Director on the Board of TotalStart. GIVE HIM A BIG HAND TO TAKE ON AS THE MASTER OF THE CEREMONY FOR THE DAY. mergers and acquisitions compliance and due-deligence, A First Generation Serial Entrepreneur, Strategic Thinker, Evangelist for Entrepreneurship, Past President TiE Kolkata Chapter, Past Regional President Indo American Chamber of Commerce – Eastern Region, A Student of Technology and The Art of War, Rabid about Cars and Aviation Industry! Prof. Ashok Banerjee Prof Banerjee is the Chairman of the Center for Entrepreneurship & Innovation at the Indian Institute of Management, Calcutta. He is also the Dean of New Initiatives & External Relations at IIM Calcutta and most importantly he is the senior most Professor of Finance at Indian Institute of Management Calcutta and a stalwart in this area. Prof. Banerjee holds an M.Com. Degree from Calcutta University and Ph.D. from Rajasthan University. At IIM Calcutta, he is a senior Professor in the Finance and Control group, and takes several advanced courses in Finance like Financial Accountancy, Corporate Finance, Corporate Restructuring and Behavioural Finance. He is also the faculty in-charge of the Finance Research and Trading Lab at IIM-C. Prof. Banerjee’s primary research interests are in areas of Financial Time Series and Operational Risk Management. Most importantly for us he is single-handedly changing the ecosystem of IIM Calcutta to making it an entrepreneurs haven for both its students and aspiring startupreneurs from outside the campus across the globe. Sri Bob Roy Sri Bob Roy is a Resident Editor at Times of India since last 12 years, with more than 2 decades of knowledge in the media industry. The publications and portals he edits include Education Times, Times Property, Megacorp, Response-led Special Features, Times Wellness, Times Travel, Times Wedding and other English magazines and books. In the language section he edits a popular monthly literary magazine called ‘Ammar Somoy’ (which comes out in Oriya and Assamese also), Ami Udita (a lifestyle magazine for women in Bengali), Aamar Career (a career-related monthly Bengali magazine for students), Jatri (Travel magazine in Bengali), Swasther Sandhane Ekti Choritro (a Wellness magazine in Bengali) and many other books. 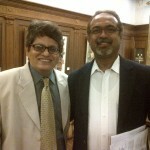 Also, he is the content head of www.kolkatamirror.com and also for www.educationtimes.com for content generated from the east. Prior to TOI he has been a producer at TV18-CNBC India. His Job responsibilities included generation/ conceptualisation of ideas, research, scripting, direction, shooting and production of news, business news, features and top entertainment programs for leading television channels such as Star, Sony, MTV, CNBC India, Zee, BBC, Doordarshan and SABe TV. Producing business news, current affairs and entertainment related features on CNBC India’s daily news programs such as India Business Day, Business@10, Bazaar Aaj, India Business Morning and India Business Hour etc and feature programs such as Trendmill and Storyboard. These apart, have worked on various other CNBC India feature programs such as Way to Go, The Road Beyond, Realty Check, eFE (a program on new e-commerce and dot.com ventures), Global Indian (a program profiling the successful NRIs with business ventures/ interests in India) as a bureau director. Have directed documentaries and features for some of the pioneering and top programs on Indian satellite TV such as India Show, The Road Show and Fast Track on Star Plus, MTV-U (a campus-based features show), MTV Rock the Vote (a humorous feature program on the 1999 General Election. I had covered the election campaigns of politicians such as Laloo Prasad Yadav, Naveen Patnaik, Mamata Banerjee etc) and TV MTV (a music program). Was involved in the production of Haadsha (a real-life case study based program highlighting social problems) for SAB TV, and the Lifestyle Show for Zee English as a Senior Correspondent, TV18 Kolkata bureau. Was Associate Director on a half-hour documentary on P. C. Sorcar for Zee. Also worked for the popular program Public Demand on Zee. We are really honoured to have Mr Roy with us today and sharing the panel with us. Sri K D Bhattacharya Sri K D Bhattacharya is the Deputy Director (I/C) Micro Small & Medium Enterprises Development Institute – Kolkata. He has done his B.Tech from Calcutta University in Cement & Special Refractories. He is an ISO 9001 Lead Auditor, Energy Manager (Thermal) and also holds Diploma in Entrepreneur Development from NIESBUD. Hr has about 27 years of working experience at MSME-DI. He has worked to develop MSEs, has hands-on worked on cluster development and also on export promotion and market support to MSMEs through CPSUS. Sri Sudip Mallik Sri Sudip Mallik is a Senior Advisor at NIESBUD. An alumnus of XLRI Jamshedpur 1987 batch, he started his career in Marketing with CMC Ltd. (a PSU in the IT Sector) and later moved on to join Digital, an MNC. In the 1990s, he worked in the IT and FMCG sectors in Kuwait for almost a decade reaching the position of General Manager. Returning to India in 2000, as Vice President, he spear-headed the Virtual Classroom initiative of Zee Interactive Learning Systems Ltd., based in Mumbai and Bangalore.He finally came back to his hometown, Delhi where he joined CMC/TCS before coming to the academic turning point in his career and taught in Noida’s leading management institutes. This opportunity further enhanced when he associated with The National Institute for Entrepreneurship and Small Business Development (NIESBUD), an autonomous institute under the Ministry of Micro, Small & Medium Enterprises. At NIESBUD he is an Advisor and now his focus is on setting up of MSME Facilitation Centres for the State of West Bengal for the benefit of entrepreneurs and developing rural clusters. 9 years in Research in Govt. of India approved pioneer R&D Lab. 1 year as Head of department in an Engineering College. She ranked first in Entrance Examination of West Bengal Public Service Commission. She has Research Publication: 4 research papers in International Journals on arsenic removal technologies for arsenic mitigation from ground water by different technologies. She is an activist and changing the ecosystem of the state through her role in the MSME Department of the Government and also beyond. Sri Ashok Sinha Roy Asoke Sinha Roy is the General Manager of District Industry Center of Howrah. He has a B. Tech (Agricultural Engg.) & Diploma in Management (IGNOU) and has been serving the Department of Micro Small and Medium Enterprises & Textiles, Govt. of W.B. for last 26 years. Before joining this Department, he also gathered 6 yrs + service experience in previous job as Junior Engg. in Soil Conservation Deptt., Govt. 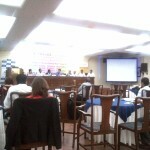 of Orissa & as Training Associate (Ag. Engg.) in ICAR sponsored project at West Midnapore district. He started his journey of working in the field level in the year 1982 as a Student Volunteer with OXFAM towards identifying, surveying and preparation of plan & estimates of Mini-irrigation/Watersheds project in the rural areas. He was associated with Technology Transfer, Lab to Land programme in the adopted rural villages of a Voluntary Organisation at West Midnapore as Trg. Associates of ICAR sponsored project for nearly 6(six) years, working and executing different appropriate technology transfer programmes towards total rural development schemes in collaboration with organisations like UNICEF, AFFRO, CAPART, District Administration and different foreign countries.He has gathered a vast working knowledge towards promotion of MSME Sector working as functional Manager, General Manager in DICs & Asstt. Director in the Directorate of MSME, W.B. for the last 26 years. While performing his assigned duties in executing all MSME Departmental Schemes and activities, he has been associated with a number of linkage institutions/organisations working in the field towards promotion of “Entrepreneurship”. Sri Dipankar Chakraborty Sri Dipankar Chakraborty is the General Manager District Industry Center of North 24 Parganas. He worked for four years in Raymond Synthetics Ltd. as Asst. Engr. Next worked three years as Asst. Manager in Reliance Industries Ltd and then one year in Indian Rayon & Industries Ltd in Worsted Yarn export marketing Division. After this joined in MSME & Textile Deptt ,West Bengal Govt as General Manager, District Industries Centre. He has several years of experience in the industry in top MNCs and then he joined the Government to make a direct difference hands-on. He is actively doing so with his work by changing the ecosystem of the MSME department with the active support of his colleagues. Sri Arijit Bhattacharyya Arijit Bhattacharyya is an entrepreneur for over 16 years, Arijit Bhattacharyya is the founder of Virtualinfocom (www.virtualinfocom.com) , India’s first game development education institute & one of the first game development production company since 1998, headquartered in Kolkata, India .He is also an Corporate Advisory Board Member SRM University. Founder of India’s first B2B portal on game development (www.virtualgamedeveloper.com);Co-Founder-Sportszonein; MD-virtualgamedeveloper. Co-Founder OMtechnoart Hub Pvt Ltd. Arijit began programming in late 1994 with BASIC, before progressing rapidly to C and C++ in early 1995 for DOS application development, then onto 32-bit development under Windows. He moved to RAD with Borland’s C++ Builder in 1998. In 1997 he became involved in Internet technologies, progressing to dynamic, database-driven websites. In 2000 as he is an Artist Arijit turned into the field of animation & late 2001 he became a Game Developer and Simulation Engineer. Arijit mentors entrepreneurs and is a very popular speaker and speaks on his ongoing research in How to Scale up Business, How to Start Smart & Wealth Dynamics. One of the Judge for “Dare to be Digital” for the game development competition at UK. Writer of Books on Animation and Game Development. Creator of First Hindu Mythological Game Mahabharat. Writer of comics such as Archer, Mahavir, Nutron, Haglu. Creator of first Indian Gaming Club. Started First Indian Cloud based Classroom on Mobile Apps, Animations, Game Development. First Indian Game Store on resources. Advisory board and course content creator of two Animation college in South India. 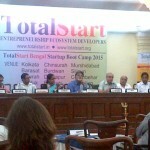 Mr. Bhattacharyya is on the Mentor Board of TotalStart. Dr. Sumit D. Chowdhury Dr Sumit Chowdhury is a global thought leader in the field of Smart Cities, Telecom and Information analytics. He is a business leader, entrepreneur and best-selling author, having led large, hyper-growth, multinational telecom and consulting companies in US, Australia and India. He has worked on technology based transformation of companies and is now focused on sustainable solutions for Smart Cities and Internet of Things. His global experience has provided depth and breadth of roles to manage people, processes, finances, projects, technology, relationships and governance. He provides mentoring & funding to entrepreneurs in areas like M2M, Internet of Things, Smart Cities, health-care, mobile internet, and career services. He is serving on the Board of 4 Start-ups. He’s been a mentor with NEN, TotalStart, Business World Accelerate programs. He is part of Mumbai Angels & CIO Angels. Sumit’s education – starting from well balanced Jesuit schooling leading to IIT Kanpur followed by MS and Ph.D from Carnegie Mellon University, has created a foundation for inquisitive problem solving and optimistic goal driven leadership. He has a diploma from Australian Institute of Company Directors. He is the author of a bestselling career management book, ‘Rules of the Game’ published by Bloomsbury India that empowers readers to enhance productivity and fast-track their careers. He is represented by the ‘Outstanding Speakers Bureau’ and speaks in different forums on technology, career and management ideas. His motivational speaker series has been hugely popular with students & professionals. He is also a speaker on several TEDx platforms. Sumit is an avid painter, having had international exhibitions of his paintings. He is also a trained musician. He is an active marathon runner and cyclist having run several full marathons and long distance cycling trips across the world. He is a visiting faculty in business management schools.Dr. 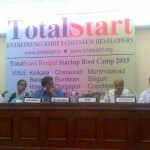 Chowdhury is on the Mentor & Governance Board of TotalStart. Sri Abraham Stephanos Mr. Stephanos is the Managing Director of Tata Steel Processing and Distribution Limited. He has worked over 13 years in NALCO and now over 18 years at TSPDL and has been a key player to the growth of the company. He is an entrepreneur at heart and thus as an intrapreneur leads the organization from the front. He is on the Board of Bengal Chamber Entrepreneurship Development Cell and a Management Committee Member of Bengal Chamber of Commerce & Industry and of several other leading bodies in the country like CII etc. He is a pass-out of NIT Rourkela in 1984 and also has an MBA from IIM Calcutta. He leads from the front any organization he spearheads and is a change catalyst. Sri Deepak Daftari Mr Daftari is the CEO eSiksha.com, he Runs www.eSiksha.com. An Active Domain Investor, An Active .co.uk TLD Investor. One of the largest portfolio holders of Two Letter .CO.UK and .UK names. Runs an All India Executive Resourcing and Head-Hunting Consultancy for IT Placements. Specialties: Helps Fortune 500 and Fortune 1000 companies acquire strategic domain assets and stealth acquisitions. Has extensive knowledge in stealth acquisitions having closed quite a few six figure domain deals and is also an active Portfolio Investor in Domain Names. 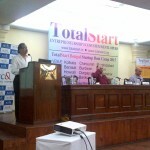 He is presently the Vice President and a Charter Member in TiE Kolkata.He is also on TotalStart’s Mentor Board. 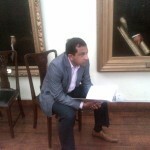 Sri Vikram Duggal Mr Vikram Duggal is a Consultant with Unitus Seed Funds. He is representing seed-stage Investors funding Startups, in addition to providing Marketing & Online Sales Consultancy. He has around 16 years experience across industries & geographies; worked with large corporates, technology start-ups, family businesses and SMEs. Specializes in setting up teams & processes, successfully launching brands, products and services nationally and scaling up operations. Areas of expertise include: Setting up e-stores, Online Selling on Marketplaces, Go-to-Market Strategy, Brand Positioning, Media Planning, ATL & BTL campaigns, Social Media, Communication & Design, Alliances, Events, Promotions, Customer Engagement. 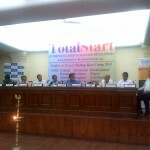 ABP (Telegraph, t2, Friends FM), Bank of America, EthnicDukaan.com, Fever FM, IFB Home Appliances, ITC, Radio Mirchi, Turtle Limited. Also a guest faculty and member of admissions panel at business schools; member of various professional and cultural associations; interests include films, music, travelling and sports. He has a PGDM from MICA Ahmedabad. 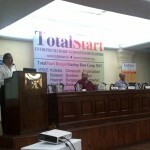 Sri Tamal Mukherjee Tamal Mukherjee is the Founder Member and Director of the Company. He worked for 16 years with different reputed financial services companies of India with a rich experience in the areas of Capital Markets and Wealth Management before stepping into entrepreneurship in the year 2008.He is having successful records of establishing Branch and Franchisee network of UTI Securities Limited. After completing the learning experience of 4 years with one preschool, he started with a dynamic vision to have multi location self operated and franchisee centre. He oversees the day to day operation of the company, specially the implementation of the expansion plan. 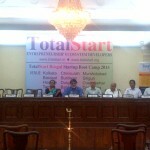 A TotalStart Entrepreneur Mentee. Sri Timir Mukherjee Timir Mukherjee is the Co- founder member and Director of the Company. He brings with him wide bouquet of experience of financial services industry and managing Investments of Leading Corporate House. He oversees the day to day overall administration of the group along with a dedicated team from HR, Accounts and Logistic.A TotalStart Entrepreneur Mentee. and Installing and monitoring Tele-Pharmacy services. He is setting up a chain of rural basic health care centers using telemedicine, telepathology and fair price pharmacy.A TotalStart Entrepreneur Mentee. 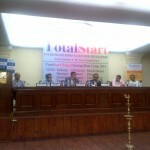 TotalStart builds entrepreneurial ecosystems to sustainably nurture and develop home grown entrepreneurs and enterprises in entrepreneurially less developed regions in the world, networked with resources from entrepreneurially developed regions in the world, in domain specific business areas relevant and sustainable for the region.